HELLO I COMPLETED THIS LO FOR THE SEPT. SCRAP YOUR AVATAR W/FABLADY. I HAD THIS AVATAR UP SINCE DUSTY WAS BORN JULY 28. HERE HE IS 9 DAYS OLD. THE TREE IS CRICUT FROM MY COMMUNITY TREE1 CUT FIT TO PAGE. 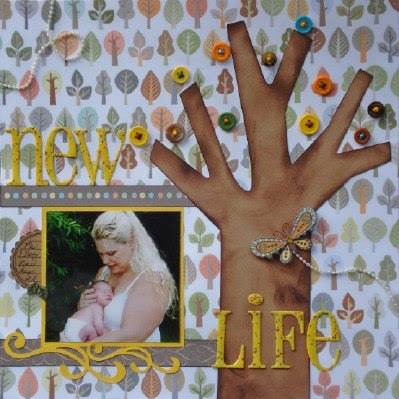 AND THE TITLE IS BLOSSOM GRANDE FROM QUICKUTZ I CUT WITH CHIPBOARD AND THEN PAINTED YELLOW AND SPRINKLED GLITTER THAT MATCHED..THE TWIST. THE BUTTONS ARE ALL HAND SEWN X. THE BUTTERFLY WAS SOMETHING I SAW FROM ONE OF KROMKITTY LO..LOVED IT..TFS! THE JOURNAL READS ME AND DUSTY NINE DAYS OLD. TFL!! PP DCWV FALL STACK.